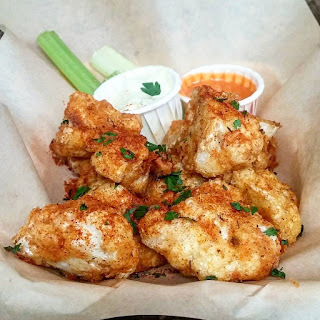 Lord of The Wings, the brilliantly named 'wingslingers' have taken over the kitchen at Hammerton Brewery's new bar House of Hammerton at 99 Holloway Road, about 5 minutes walk from Highbury & Islington tube station. Serving daily until 17th September, you can enjoy the amazing wings, with a choice of 5 different sauces - South Carolina is my favourite (but more research is needed...) - plus cauliflower 'wings' for vegetarians and some great sides. Plus all of Hammerton's great beers and more. You need to go! "Wingslingers Lord of the Wings are taking over the kitchen of the newly opened House of Hammerton in Islington – Hammerton Brewery’s first pub! Starting 17th of August, you’ll be able to get your wing fix there everyday for a month! They’ll be serving their from fresh, fried, free range wings covered in one of their 5 signature sauces, each uniquely inspired by regional North American cuisines. Wash your wings down with a choice from Hammerton’s full range of beers, including some exclusive one off brews. Lord of the Wings is an authentic shack-style vendor inspired by the American cuisine staple: the Buffalo wing. Founded by two brothers and inspired by their American heritage, Lord of the Wings offers deep fried chicken wings covered in one of our signature sauces, all uniquely inspired by regional culinary traditions in the United States.